In the third book in “what will likely be a long and successful series” (San Francisco Magazine), Japanese antiques dealer and PI Jim Brodie goes up against the CIA, FBI, Department of Homeland Security—and a killer operating on both sides of the Pacific. But as soon as they exit the building, a sniper attacks them from the roof of the Asian Art Museum. Quick thinking allows Brodie to escape, but Nobuki ends up hospitalized and in a coma. Brodie soon realizes that, with the suspicious and untimely death of Nobuki’s oldest son a week earlier in Napa Valley, someone may be targeting his friend’s family—and killing them off one by one. 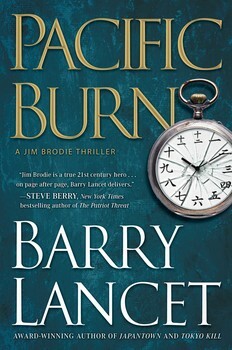 PACIFIC BURN is author Barry Lancet’s third novel featuring antique dealer/investigator Jim Brodie as the main character. In this latest story Brodie still sells Japanese fine antiques, still runs the Tokyo based investigation agency he inherited from his father and still has to deal with his young daughter as a single parent. The story begins in San Francisco with the murder of the son of a famous Japanese artist, Ken Nobuki. Only days later, after a meeting with Brodie and the mayor of San Francisco concerning an art exchange program, there is an assassination attempt on Nobuki which leaves him in a coma. Meanwhile Brodie heads off to Washington D.C. where Nobuki’s daughter, Naomi, an anti-nuclear power crusader, is under investigation by the CIA, DHS and the FBI for possible nuclear threats. It appears that the entire Nobuki family is in danger so after calming the nuclear issues, Brodie heads off to Japan to make sure the rest of the Nobuki family is under protection by his agency. There is long list of suspects which include those in Japan and America opposed to the art exchange and those opposed to Naomi’s anti-nuclear stand. Through his channels in Japan, Brodie discovers he also has been targeted for death. Brodie’s investigation delivers a high level of action including additional murders, a kidnapping, a scenic chase through a legendary volcanic part of Japan and a near death confrontation for him and his police officer girlfriend. Author Barry Lancet does a great job of exposing the reader to the Japanese culture and to the antique art world Brodie works in. He also shares through the relationship with Brodie and his daughter the difficulties of being a single parent when one’s work involves significant travel and danger. Lancet brings into the novel an interesting group of characters from business, the art world and the Japanese underworld and blends them into an exciting story with plenty of twists and turns and an ending that will definitely surprise the reader. PACIFIC BURN is a great read for those who like a fast paced, quick read thriller. Another great review by Booking Pap Pap! I think I'd enjoy this series.